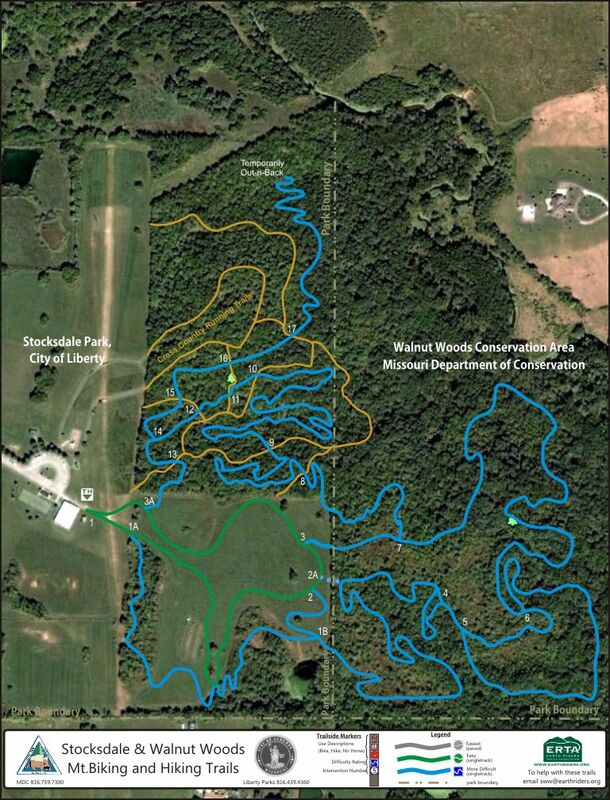 Bad Rock Creek Disc Golf Course is an 18-hole course at Stocksdale Park in Liberty. Following the "Tee It Forward" philosophy, this course was designed for players of all skill levels - beginner, advanced and pro. Through the placement of alternate tee pads and additional baskets, Bad Rock Creek DGC combines three courses - red, blue and gold - into one 18-hole layout. Course map (PDF). Red Course: Use short tee pads marked with red paint (for holes in which they occur) to the blue baskets. Use long tee pads (unpainted) to the blue baskets. Designed for experienced and advanced players. Gold Course: Use long tee pads to the 9 gold baskets (for holes in which they occur). Championship layout designed for advanced and pro play with greater length, obstacles and hazards. Liberty Parks and Recreation works cooperatively with the KC Flying Disc Club on course maintenance, enhancement, and promotion. The Club holds a weekly tournament at the course one evening a week in the spring through fall. The Liberty Dog Park includes 3 acres of fully fenced area for dogs to enjoy as well as a 5,400 square foot section dedicated to more diminutive canines. The Liberty Dog Park is located within Stocksdale Park on the east side of Liberty. Admission is free, but users must abide by established Rules and Regulations (PDF). Check out the frequently asked questions (PDF) about the dog park. Fountain Bluff Sports Complex offers 8 ponds for those looking to cast a line. The Missouri Department of Conservation stocks the ponds with rainbow trout several times each year. A Missouri fishing permit is required, and a trout permit also is required if trout are harvested. Liberty's multi-use trail system covers more than 10 miles of trails through parks and greenways across the city. Trails range from less than 1/4 mile to 2 1/4 miles. Many of the trails connect with neighborhood sidewalks and can offer walkers, bikers, and runners miles of opportunities for recreation and fitness. Rollerblading is welcome on all asphalt trails, although Cates Creek and the north trail at Westboro-Canterbury offer the best surfaces. Want to cool off on a hot summer day? Check out Liberty's two splash pads. Replaced in 2017 and located next to Liberty's main Fire Station, the Ruth Moore Park splash pad features a fire theme with hose sprayers, a fire ring that rains water, and more! Or head to City Park where kids can keep cool while dodging the water sprays.